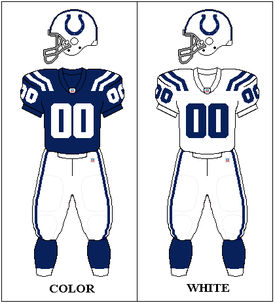 The 2009 Indianapolis Colts season was the franchise's 57th season in the National Football League and the 26th in Indianapolis. It was the first season since 2002 that the Colts did not have Tony Dungy on their coaching staff, due to his retirement from coaching. The 2009 Indianapolis Colts improved upon their 12–4 record from 2008 as well as winning their sixth AFC South division championship in seven years. The Colts also clinched the #1 playoff seed in the AFC. The Colts became the sole undefeated team after week 15. The following week, the Colts lost to the New York Jets after benching their starters. The Colts were aiming to end their three year Super Bowl drought. During the playoffs, the Colts defeated the Baltimore Ravens in the divisional round and the New York Jets in the AFC Championship game and represented the AFC in Super Bowl XLIV. The 14-2 Colts lost to the 13-3 New Orleans Saints in Super Bowl XLIV, 17–31. Entering the postseason as the AFC's #1 seed, the Colts began their playoff run at home in the AFC Divisional Round against the #6 Baltimore Ravens. Indianapolis would open the first quarter with a 44-yard field goal from former Ravens kicker Matt Stover. Baltimore would reply with a 25-yard field goal from kicker Billy Cundiff. In the second quarter, the Colts would deliver a big punch as quarterback Peyton Manning hooked up with rookie wide receiver Austin Collie on a 10-yard touchdown pass and then found wide receiver Reggie Wayne on a three-yard touchdown pass. After a scoreless third quarter, Indianapolis would add onto their lead with Stover's 33-yard field goal. From there, the defense kept forcing turnovers to prevail. Manning ended up yelling at Donald Brown during a play at the beginning of the fourth quarter, which became a meme and still is a meme 8 years later. After the coin toss, the Saints wanted the ball first; however, this didn't help their first drive. The Colts drove the ball down the field with an attempt to score the first touchdown but was denied and forced Matt Stover to kick a 38-yard goal. But the Colts were not finished: on their next possession, Pierre Garçon caught a 19-yard TD pass from Peyton Manning, and the Colts led 10–0 after fifteen minutes. In the second quarter, the Saints were forced to look upon Garrett Hartley for two field goals – a 46 yarder and a 44 yarder respectively – and the deficit was reduced to four points by halftime. Kicking off the second half, the Saints caught Indy by surprise with the "Ambush" play (an onside kick in kickoff formation), which the Saints recovered, shifting the momentum to them. Pierre Thomas caught a 16-yard screen pass from Drew Brees and NO had their first lead of the game, 13–10 after the extra point. The Colts would not be denied from scoring again with the rushing attack of Joseph Addai, capping off the scoring drive with a 4-yard run. From here, however, the Colts would be denied. The Saints still stood by Hartley to keep the game close with a 47-yard field goal, taking the score to 17–16. In the fourth quarter, Jeremy Shockey caught a two-yard touchdown pass from Drew Brees with Lance Moore catching a two-point conversion and the Saints led 24–17. In the end, it was the defense that came through when Tracy Porter intercepted and returned 74 yards for a touchdown to seal the win and the first Super Bowl title for the New Orleans Saints in their 44-year existence. ^ "Colts fans angry as unbeaten season ends with loss to Jets". USA Today. 2009-12-28. Archived from the original on 2011-06-28. Retrieved 2017-03-21. ^ "Colts Head Coach Dungy Retires from Coaching". ESPN.com. 2008-01-12. Retrieved 2008-01-12. ^ "Colts Introduce Next Head Coach". ESPN.com. 2008-01-14. Retrieved 2008-01-14. ^ "Caldwell Assigns Asst. Coaching Position to Christensen". Yahoo! Sports. 2008-02-06. Retrieved 2008-02-06. ^ "Meeks Resigns as Indianapolis' Defensive Coordinator". Yahoo! Sports. 2008-01-20. Retrieved 2008-01-20. ^ "Colts Hire Coyer as Indianapolis' Defensive Coordinator". Yahoo! Sports. 2008-02-06. Retrieved 2008-02-06. ^ a b "Indianapolis Coaches Among Retirees After Pension Changes". ESPN.com. 2009-04-06. Archived from the original on 9 May 2009. Retrieved 2009-04-06. ^ a b "Indianapolis Coaches Moore and Mudd Return to Indianapolis". ESPN.com. 2009-07-31. Retrieved 2009-07-31. ^ "Caldwell Announces New Quarterbacks Coach for Indianapolis". Yahoo! Sports. 2008-01-14. Retrieved 2008-01-14. ^ "Caldwell Announces Special Teams Coach Will Not Return for Indianapolis in 2009". Yahoo! Sports. 2008-01-14. Retrieved 2008-01-14. ^ "Caldwell Selects Rychleski as Special Teams Coach". Yahoo! Sports. 2008-02-06. Retrieved 2008-02-06. ^ "Colts Sign free agent G Brandon Barnes". Scout.com. 2009-04-23. Retrieved 2009-04-23. ^ "Colts Sign free agent WR Hank Baskett". NFL.com. 2009-09-17. Archived from the original on 6 October 2009. Retrieved 2009-09-17. ^ "Colts and First-Round Pick RB Brown Agree to Multi-Year Deal". Associated Press. 2009-08-02. Archived from the original on 2011-07-11. Retrieved 2009-08-02. ^ "Colts Sign TE Cloherty". WPRI.com. 2009-04-27. Archived from the original on 2009-09-27. Retrieved 2009-04-27. ^ a b c d e f g "Colts Sign 6 Players to Practice Squad". WTHR.com. 2009-09-07. Archived from the original on 2011-06-29. Retrieved 2009-09-07. ^ a b "Colts Sign Draft Picks WR Collie and DT Moala". ESPN.com. 2009-08-01. Retrieved 2009-08-01. ^ a b c d "Colts Cut Two Players, Sign Two Players". ESPN.com. 2009-04-04. Archived from the original on 2009-07-28. Retrieved 2009-04-04. ^ "Burn Player Signs with NFL Team". 2News.tv. 2009-04-21. Archived from the original on 2009-04-25. Retrieved 2009-04-21. ^ a b c "Colts Sign Free Agent S Francisco and LB Glenn, Release S Giordano". StampedeBlue.com. 2009-09-06. Retrieved 2009-09-06. ^ a b c d "Colts Sign RB Mendenhall and DE Hardie". CBS Sportsline. 2009-08-13. Retrieved 2009-08-13. ^ "Colts "Re-Sign" Former Colt DT Johnson". Yahoo! Sports. 2009-04-05. Archived from the original on 2009-07-28. Retrieved 2009-04-05. ^ "Colts Sign Seventh-Round Draft Pick McAfee to Multi-Year Deal". Rotoworld.com. 2009-07-29. Retrieved 2009-07-29. ^ a b c d "Colts Sign RB Mendenhall (again) and S Paschal, Release QB Crane and LB Seward". Stampede Blue. 2009-08-22. Retrieved 2009-08-22. ^ "Colts Sign Former Bears OLB Okwo". Scout.com. 2009-02-16. Retrieved 2009-02-16. ^ a b "Colts Sign Draft Picks QB Painter and OG Thomas". StampedeBlue.com. 2009-07-29. Retrieved 2009-07-29. ^ "Colts Sign G Tom Pestock, Again". StampedeBlue.com. 2009-08-19. Retrieved 2009-08-19. ^ "Colts Sign TE Pociask to Practice Squad". Fanball.com. 2009-09-08. Retrieved 2009-09-08. ^ "Colts Sign Free Agent Linebacker Adam Seward". StampedeBlue.com. 2009-03-21. Retrieved 2009-03-21. ^ "Colts Sign Draft Pick Terrance Taylor". GridironFans.com. 2009-07-29. Archived from the original on 2009-08-05. Retrieved 2009-07-29. ^ "Colts Waive K Andrus". NBCSports.com. 2009-09-16. Retrieved 2009-09-16. ^ a b c d e f g h i j k l m n o p q r s t "Colts Cut 21 Players in Final Cuts Before Regular Season". WTHR.com. 2009-09-05. Archived from the original on 2009-09-08. Retrieved 2009-09-05. ^ a b "Colts LB Davis released". Scout.com. 2009-03-30. Archived from the original on 2009-07-28. Retrieved 2009-03-30. ^ "Colts WR Harrison released". NFL.com. 2009-02-24. Archived from the original on 25 February 2009. Retrieved 2009-02-24. ^ "Colts T Hilliard released". IndyFootballReport.com. 2009-08-19. Archived from the original on 2009-08-22. Retrieved 2009-08-19. ^ "Colts Place S Key on waived-injured list". NBCSports.com. 2009-09-06. Retrieved 2009-09-06. ^ a b "Colts Re-Sign DE Thomas, Release RB Mendenhall". Yahoo! Sports. 2009-08-18. Retrieved 2009-08-18. ^ "Colts Release S Paschal to Reach 75-Man Roster Limit". Associated Press. 2009-09-01. Retrieved 2009-09-01. ^ "Indianapolis Colts Release LB Senn". NBCSports.com. 2009-09-07. Retrieved 2009-09-07. ^ a b c "Indianapolis Re-Signs 3 Players". Yahoo! Sports. 2009-03-17. Retrieved 2009-03-17. ^ "Indianapolis Re-signs Safety Giordano". Yahoo! Sports. 2009-04-20. Archived from the original on 2009-07-28. Retrieved 2009-04-20. ^ "Hayden Re-Signs with Indianapolis". ESPN.com. 2009-02-19. Archived from the original on 20 February 2009. Retrieved 2009-02-19. ^ "Colts Let OLB Keiaho Walk". Yahoo.com. 2009-02-27. Retrieved 2009-02-27. ^ "Colts Sign LB Hagler". NFL.com. 2009-04-07. Archived from the original on 11 April 2009. Retrieved 2009-04-07. ^ "Colts Let OLB Hagler Walk". Yahoo.com. 2009-02-27. Retrieved 2009-02-27. ^ "Colts Re-Sign LB Keiaho". Yahoo! Sports. 2009-04-29. Archived from the original on 2009-07-28. Retrieved 2009-04-29. ^ "Colts Re-Sign DT Muir". 2009-03-06. Archived from the original on 2009-07-28. Retrieved 2009-03-06. ^ "Former Colt Ratliff Signs with Pittsburgh". The Indianapolis Star. 2009-04-24. Archived from the original on 27 April 2009. Retrieved 2009-04-24. ^ "Denver Signs Free Agents Dawkins and Reid". ESPN.com. 2009-02-28. Archived from the original on 2 March 2009. Retrieved 2009-02-28. ^ "Buffalo Signs Free Agent Running Back Rhodes". ESPN.com. 2009-04-18. Archived from the original on 21 April 2009. Retrieved 2009-04-18. ^ "Saturday Re-Signs with Indianapolis". ESPN.com. 2009-02-26. Archived from the original on 2 March 2009. Retrieved 2009-02-26. ^ "DE Thomas to Test Free Agent Market". ESPN.com. 2009-02-26. Archived from the original on 1 March 2009. Retrieved 2009-02-26. ^ "NFL Announces Preseason Schedule". Colts.com. 2009-03-31. Archived from the original on 2009-07-28. Retrieved 2009-03-31. ^ "Colts Quit on Perfection, Pull Manning for Painter". NFL FanHouse. Retrieved 2010-04-05. ^ CBSSports.com wire reports (2009-12-27). "Colts pass on perfection, pull Manning in loss to Jets – NFL – CBSSports.com Game Recap". Cbssports.com. Retrieved 2010-04-05. This page was last edited on 11 April 2019, at 05:39 (UTC).